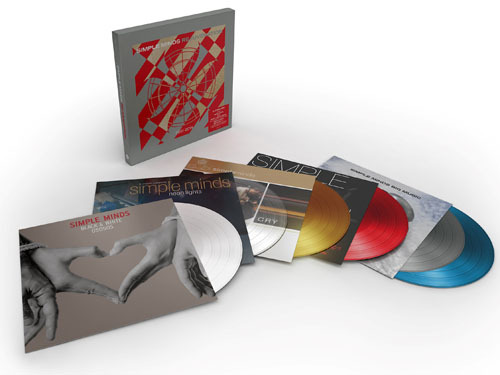 After leaving the Virgin label, and a one-off album with Chrysalis, Simple Minds took stock and decided to make records for themselves. An album of cover versions of songs dear to Jim Kerr and Charlie Burchill, Neon Lights, was released in 2001, followed by Cry in 2002, an album of new compositions recorded in Glasgow and Sicily. The recordings for Black And White 050505 were completed on the 5th May 2005, hence the title. This album along with Neon Lights and Cry make their first appearances on vinyl in this box set, with specially-created outer and inner sleeves, and include some exclusive bonus tracks from the CD releases. Graffiti Soul continued the band's return to the top, charting at #10 in May 2009. Big Music [2 LP] was released in October 2014, charting at #12. All of the albums are pressed on different coloured 180 gram vinyl, and the rigid slipcase features a brand new note by Jim Kerr.